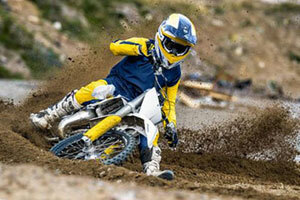 If you're in the market for a new off-road bike in 2014, you'll be pleasantly surprised with the bike lineup from Husqvarna. The following 2014 Husqvarna First Ride video is seven minutes long and is full of excellent information - it's not just an endless video of an expert rider piloting a tweaked-out works bike around a motocross track. Dirt Rider Magazine's Chris Denison offers his opinion about what he likes and equally important, what he doesn't like, about the Huskys. Chris talks about the two strokes, four strokes, motocross, and off-road bikes that Husqvarna is offering in its 2014 dirt bike lineup. Although not considered as mainstream as the "Big 5" bikes (Suzuki, KTM, Honda, Yamaha and Kawasaki), Husqvarna has stepped up their game for 2014 and will get much more attention from off-road, motocross, and enduro riders, both two stroke fans as well as four stroke fans.